Categories and tags in Directories Pro are used to organize listings into groups, just like categories and tags you have when writing posts in WordPress. For example, a business directory may have categories such as Restaurants, Shopping, Education, Hotels, and tags like Good for kids, Has parking, and Alcohol. The difference between categories and tags is that categories are hierarchical in structure while tags are a flat namespace. Follow the steps below to create a category for your directory. Select Categories under your directory menu in the admin sidebar. 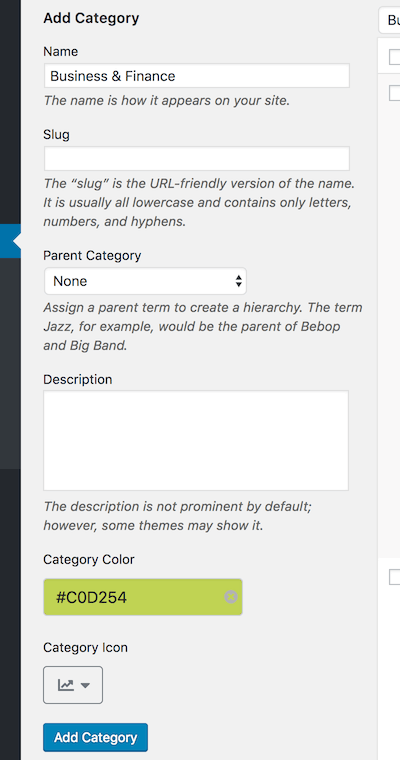 Name, Slug, Parent Category, Description - Enter these fields as you do with categories for posts in WordPress. Category Color, Category Icon - Select an icon and a color that best represents the category. Click the Add Category button to add your category. Follow the steps below to create a tag for your directory. Select Tags under your directory menu in the admin sidebar. 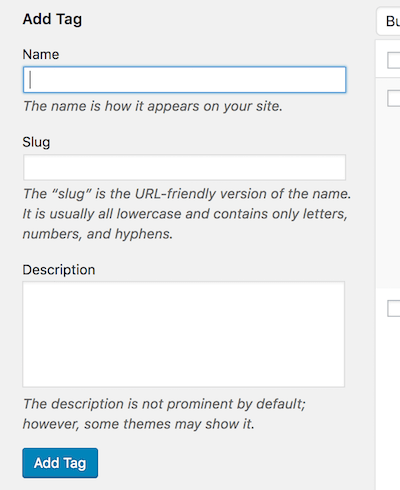 Enter Name, Slug, and Description fields as you do with tags for posts in WordPress. Click the Add Tag button to add your tag. Select Categories or Tags under your directory menu in the admin sidebar. In the category/tag list table, hover over to the row of the category/tag that you wish to edit and click the Edit link that appears in the Name column. Make any changes needed and then click Update. In the category/tag list table, hover over to the row of the category/tag that you wish to delete and click the Delete link that appears in the Name column. In the popup window, click OK to delete the category/tag.